Correio Address Validation System - Cutek, Inc. If you think address validation software is unnecessary because your statement vendor cleanses the addresses before statements are mailed, think again. Your credit union likely sends plenty of mail that doesn’t go through your statement vendor. Correio uses the United States Postal Service (USPS) address database to ensure that all of your member address records remain standardized and cleansed. With multiple integration points throughout the Episys® platform, Correio can run in batch mode against your entire database as part of your periodic maintenance procedures, or it can be invoked on demand for situations such as new member enrollment. It can also be invoked from a web browser for individual shipping or similar purposes. The product accesses both the standard USPS database and the USPS Delivery Point Validation (DPV) database, ensuring maximum accuracy. CUTEK's Correio Address Validation™ solution works by integrating with the USPS Address Matching Service Application Programming Interface (AMS API) to access the post office's address database, which is updated bi-monthly, and pushes the pertinent member address data back to Symitar's Episys™ system. When the credit union's member service representative (MSR) types in an address, Correio kicks in by validating the address. If the address is bad, a dialog box appears onscreen immediately alerting the MSR. Correio also standardizes the addresses by adding the ZIP+4 to the zip code to allow for more efficient and accurate sorting and routing. But CUTEK doesn't stop there with Correio. Instead of just using the standard AMS functionality, which looks for a range of addresses, CUTEK has added the USPS's Delivery Point Validation (DPV) database, which deepens the level of information by pinpointing the address, telling if it's a house, apartment, or business. This added feature saves your credit union money by providing a sharper focus of a member's address, which saves time during a search. The Data Warehousing Institute estimates that poor-quality customer data costs U.S. businesses a staggering $611 billion a year in postage, printing, and staff overhead. Data quality: Data Quality is the reliability and effectiveness of data, particularly in a data warehouse. Data quality assurance (DQA) is the process of verifying the reliability and effectiveness of data. Maintaining data quality requires going through the data periodically and scrubbing it. Typically this involves updating it, standardizing it, and de-duplicating records to maximize the effectiveness of the relationship with your members. Accurate address validation: Correio AVS uses the latest U.S. Postal Service (USPS) address data file. As a result, your Member Service Representatives can look up an address, verify it, and update it to your Symitar core processing system in a standardized format. This enhanced accuracy of your data quality is due to performing address validation at the point of data entry, which improves delivery and response rates of member mailings. In addition, "easy integration" into existing Symitar PowerOn™ specfiles, including text specfiles, HTML specfiles, and SymForms make Correio a valued add-on to your Episys™ system. 3rd Party information and Customer relationship management: Ongoing postal address verification is essential for your credit union's quality Customer Relationship Management (CRM). Address standardization helps to improve member's data integrity, ensuring bills, mail, and shipments reach their destinations. This standardization keeps your members happy and saves your credit union time and money. Correio's robust capabilities allow it to integrate with most CRM systems as well as other 3rd party applications to ensure that all address data coming into your credit union is a clean as possible. Fraud prevention: Correio mitigates fraud cases caused by bad addresses by correcting or validating an address at the point of entry, which helps reduce potential fraud cases where invalid address are being used. If a member does not know their address or cannot provide you with valid parts (i.e. Apt#, spelling of the street, or P.O. Box), then you may want to consider verifying additional items like credit reports, getting a copy of a tax bill, or other acceptable forms of identification. Keystroke reduction: On the keystroke reduction, using Corrieo, you can input only the Street and 5-digit zip code. The Correio software will verify and normalize the Street, fill in the City and State, and add the ZIP +4. Real-Time vs. Batch Verification: On average, databases without address verification will contain 15-22% undeliverable addresses. Real-Time Address Verification: Corrects and validates addresses at point of entry empowering the data owner to correct their own address. Also notifies the user of a bad address so they can confirm with the customer (member, employee, 3rd party (i.e. In Direct Dealers and Mortgage Companies.) 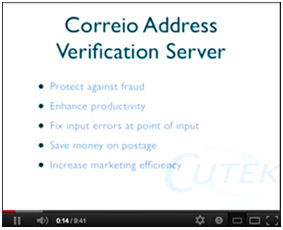 Correio can help reduce the entries of undeliverable addresses by 15-22% . Resulting savings: For such a quick and precise address validation tool, Correio AVS is competitively priced to meet a swift ROI. Due to better data quality, higher operator throughput, and reductions in returned mail and undelivered shipments, Correio can, without a doubt, add tremendous value to your credit union. It costs 1 unit to fix a bad address at the point of entry when customer is present. It costs 10 units to fix a bad address that is saved in the database and identified via batch. Running reports, proactive phone calls, user's time. It costs 100 units to fix a bad address that was sent mail and the mail was returned. In general, dealing with exceptions. “Correio has been the perfect method of getting a member’s address into the database correctly the first time. If Correio cannot verify the address, then you still have the opportunity to let the member know right there. You don’t have to waste postage to find out you have an undeliverable address.” ~ Tammy Williams, AVP Information Technology Keesler Federal Credit Union." Contact a CUTEK Sales Rep today for more information about how Correio Address Validation™ can help your credit union.